I received this lovely little product to review through my fabulous friend Mumra. 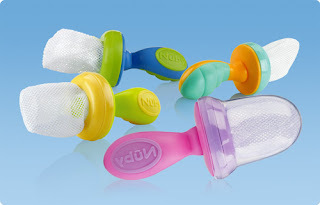 It is a hand held weaning product with a net that can be filled with a variety of goodies, such as fruit, veg or even ice, which means it can be used as a weaning or a teething aid. As my little one is teething i filled it up with frozen tropical fruit and handed it over. He seemed to naturally know what to do and put it straight into his mouth and started sucking the fruit through the net. To say he loved it would be an understatement. I tried to reposition it at one point and i thought he was going to bite me. He was like a dog with a bone! Make sure your little one has a fleece back bib on to soak up all the dribble / water from the frozen fruit! What are the good bits about this product? 1. It is a lovely size which has obviously been anthrometrically measured beautifully to fit ergonomically into the baby’s hand. He held it perfectly and I could see he looked comfortable holding it. 2. It’s great that there is a variety of food stuffs that can be put inside the net. 3. I love that it holds all the food in one place, no pushing it around the highchair tray. I would really like to have a protective cover for the netting as it shows on the picture above on the pink Nibbler, which would then make it very portable. Hahaha, no comment.. the fingers and the eyes say it all! Back away from the Nibbler its ALL mine! Great review and love the piccie's!! !